Whether it’s snowing or the sun is shining on a hot summer day, Lake Geneva is a nationwide destination for outdoor adventure year-round. Only a short drive from Chicago and Milwaukee, Lake Geneva attracts thousands of visitors annually. Stay at any one of the area’s luxury resorts, and explore the kind of adventures you can’t find in the city, like skiing on a mountain or delivering mail by boat (yes, really). 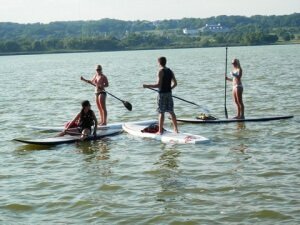 Here’s a look at some of the many ways to get active in Lake Geneva, Wisconsin. Explore your adventurous side at The Mountain Top at Grand Geneva where skiing and snowboarding are popular all winter long. The Mountain Top caters to both amateur and seasoned skiers and has over 18 versatile runs up to a quarter mile in length. And snowboarders can take advantage of six miles of designated, snow-covered terrain. Both skiers and snowboarders have three chairlifts to the mountaintop and rental facilities at the resort. Guests who are staying overnight at the Grand Geneva Resort & Spa can hop aboard a trolley to be taken back to the resort when the day is over. At Grand Geneva, you can also rent equipment for sledding or ice skating. Ice skates can be rented from the ski shop at The Mountain Top, where there’s an outdoor rink surrounded by snowy wilderness. Families with smaller children may to look into renting a sled to ride down the ski hill. After skating on a rink, skaters can warm up by the outdoor fire pit or indoor fireplace inside the lodge where snacks and drinks are offered. Other available sites for ice skating include The Ridge Hotel, The Abbey Resort and Lake Lawn Resort. Once the snow melts and flowers start to bloom, head over to Lake Geneva Bike Path (parking is available at Veterans Park) for a day of adventure, biking through the scenic landscape in Lake Geneva. The trail has five different color-coded routes that take you through forested wetlands, neighborhoods with homes and retail shops, and along the beautiful White River. The trail stretches for 8.9 miles and bikers can rent their bikes from Pedal & Cup—a five-minute drive north of Lake Geneva in the historic Springfield Depot. Guests looking for a more rugged trail for mountain biking can opt to visit the Arbor Trail at Lake Geneva Canopy Tours & Outdoor Adventure Center. 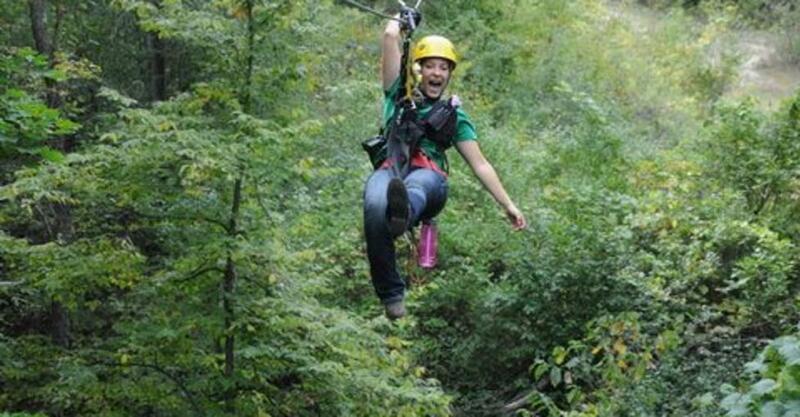 Speaking of Lake Geneva Canopy Tours, this is one of the coolest places to spend a spring day, ziplining. Located on a 100-acre property, the adventure center has eight zip lines that give thrill-seekers a bird’s-eye view of Lake Como and a variety of wildlife as they fly past green trees, over meadows, and from treehouses to bridges. The center also has ropes courses as well as hiking and biking. Hikers can take off on the Arbor Trail on one of three paths (beginners, intermediate, and expert). During spring, trees along the path sprout ripe apples and fields are full of blooming wildflowers. If you’re not into heights or hiking adventures, keep your feet firmly planted on the ground and tee off at Geneva National Resort, an upscale golf course located off the shores of Lake Como and designed by the iconic Arnold Palmer. The area has 54 holes for both amateur and skilled golfers and is divided into three courses: Arnold Palmer Course, Gary Player Course and Lee Trevino Course. 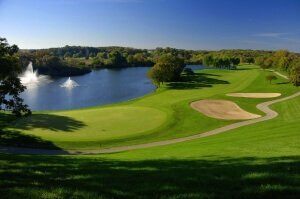 Golfers can stay overnight at the Geneva National Resort and make a weekend out of it. Grand Geneva Resort‘s two premium golf courses, The Brute and The Highlands are available to the public and hotel guests. Well, it’s summer, which means one thing: beaches. Four public-access beaches are available for visitors around the lake. In the town of Lake Geneva, Riviera Beach is located near downtown, named for its close proximity to Riviera Pier. It has a great location and is known for its cleanliness, warm waters, and lifeguards on duty. Big Foot Beach State Park is another fantastic place to kick back and enjoy the warm sun while enjoying a spectacular view of Lake Geneva. Additionally, guests can choose to camp overnight in the State Park’s designated campgrounds. Two additional beaches include the Village of Fontana Beach on the western shore of the lake, and the Williams Bay beach, both with bathhouses and lifeguards on duty. For a true summer adventure, Geneva Lake offers a host of water sporting activities, with boating a must-do for vacationers. From joining a small cruise, to jet skiing on the lake, to kayaking, the Lake Geneva area has a variety of opportunities to get you out on the lake. Lake Geneva Cruise Line offers a one-of-a-kind U.S. Mailboat Tour, one of only a few services left in the country where mail is delivered by boat. Guests on the tour cruise the lake, as mail jumpers deliver mail to over 75 houses along the way. The cruise line also offers a variety of other tours including one for ice cream lovers – their 2 pm Ice Cream Social. But that’s not all. There’s jet skis, pontoon boats, kayaks, paddleboards, and rafts – all available for rent at places around the lake. Luckily, Lake Geneva has plenty of activities and accommodations available throughout the year, including indoor waterparks. Timber Ridge Lodge Waterpark is famous for its massive 50,000 square foot indoor and outdoor waterpark. The attraction features 35-foot high slides, lazy rivers, heated pools and tons of water rides. Guests staying overnight at the Timber Ridge Lodge get passes to the waterpark, and children of all ages are welcomed. There are lots of other activities to do year-round, notably at Grand Geneva Resort including indoor rock climbing, an indoor and outdoor pool, and seasonal fun like sled bowling, scavenger hunts, and broom ball (hockey-like game). The resort prides itself in offering unlimited activities throughout the year and invites children to join its Kids Adventure Camp where they can go on nature walks, stargaze, and play glow in the dark bowling. Or if you’re leaving the kids at home, a Spa Holiday at The Well Spa at Grand Geneva or the Avani Spa at the Abbey Resort in Fontana, on 90 gorgeous acres, is always a relaxing and rejuvenating vacation experience. Finally, horseback riding at Dan Patch Stables at Grand Geneva is one of the best experiences to have in the area. The stables offer several programs from simple pony rides for children to a romantic carriage ride for couples, to a 45-minute guided trail ride. There’s also a petting farm on-site at the Stables. For more ideas on year-round activities and adventure in the Lake Geneva area, download VISIT Lake Geneva’s extensive Visitors Magazine.